You'd think that a woman such as myself who always wings her eyes would have a long relationship with various eyeliners, but I'm a relative newbie. I used to wear liquid eyeliner that would always flake off in places. I moved on to a traditional pencil and am now making yet another switch. I finally broke down and paid over $10 for L'Oreal HiP Kohl Liner in teal. That applicator you see on the end is not a brush. It's a rough, flexible wand. Because the top is narrowed like a tube of mascara, you are forced to use the applicator. This is a problem because this stuff makes a mess when applied dry. I had teal dust all over my cheeks and had to reapply my blush after removing it. Applied wet, it was neat, but I had to do it by tapping a wet eyeshadow brush on the wand. Neither efficient nor enjoyable. The wand is helpful in making a sharp line, important for winged eye makeup. Overall, I liked the product and it's long-wear, but I doubt I'd buy another vial. L'Oreal's cream liner with angled brush may be more up my ally. How do you apply it? 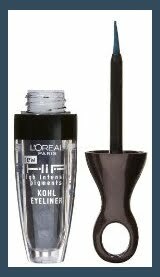 I have the same product and have been using different kohl and their application is much different than liquid eyeliner. They should be used inside the lower and upper eyelid, not over the upper lashes. So, when I use it, I take off the wand, tap it a little to take off the excess, put it on my inside lower eyelash line and then I close my eye and slowly roll the wand between my eyes, so that the powder spreads. It is true, though, that some powder can fall under the eyes or on the cheeks, so I always apply it on first, and then begin putting foundation, ... on. I hope I've been able to help. Thanks for the tip, but I may be doomed if that's how I'm supposed to apply it. Do you mean the waterline? I can't get anything to stay there! It spreads to my eye immediately, causing all sorts of problems and excessive tearing. I'll try it though and let you know. Yes, exactly, the waterline. Both the upper eyelid one and the lower eyelid one. I find that kohl stays much longer than pencil for me. Halfway through the day and it seems to be working. No eye irritation, and it's not smearing and making me look like a Courtney Love impersonator either. I hope you like it and it works well for you in the long run!